Before the financial crisis, UK banking had a “sales culture”, according to a report by the New City Agenda and Cass Business School, which led to banks booking too may toxic loans onto their balance sheets. That culture is “a set of organisational norms and practises that encourages employees to aggressively focus on making short term sales,” according to the authors. In one Halifax branch, there was a weekly ‘Cash or Cabbages day’. Employees who exceeded their sales were publicly rewarded cash. 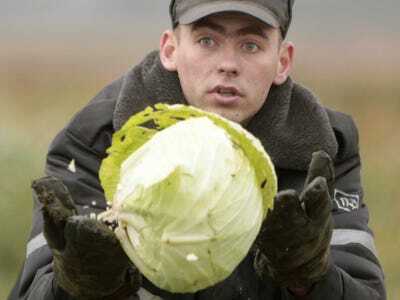 Those who missed their bonuses were given cabbages. There is significant evidence of a wide spread ‘sales culture’ which rewarded staff for aggressively promoting financial products, irrespective of risk and customer needs. This led banks to make risky loans and engage in bad practises, resulting in toxic loan books and mounting fines. This has undermined the balance sheets of the banks as well as the public’s confidence in them as trusted institutions. Two tellers at branches of the bank in Glasgow and Paisley had the vegetables placed on their desks within full public view. In the first case, an 18-year-old male teller was said to be deeply upset by the cabbage put on his desk. In the second case, which only emerged yesterday, a 24-year-old had a cauliflower placed on her desk. She was apparently told she could only pass it on when someone opened an account. It’s much more popular to suggest investment banking was to blame for the crash in 2008, but there’s a decent case that the big failures lay in bread-and-butter retail banking. Those are the issues that the New City Agenda is looking into. We would need a second report to address the next important question: Why cabbages?